I know! I know! It has been too long since I have posted and the reasons are far too complex to get into right now. Expect a future post to get to the bottom of that (or at least the middle). 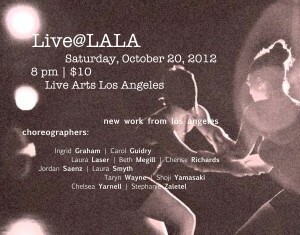 Right now I want to celebrate another great gathering of dancers and dance artists at the Live @ LALA series' first showing, featuring works of local dance makers in this talent filled area. The venue is a super fun and chill dance studio called Live Arts Los Angeles (hence LALA) and the show was a great event, with refreshments for the audience members and wine at the bar. Here is my personal run down of the show! Carol Guidry choreographed and danced in a tango with Omar Olivas entitled "Tango de Los Muertos." It was the perfect opener for this loosely Halloween themed night of dance. The dancers rose from the grave (or was it a bed? or both?) to rekindle their romance through a seductive tango that was exquisitely executed and well designed for stage. Their face paint in the style of the skeletons of Dia de Los Muertos was playful and effective. Lindsey Lollie and Chelsea Yarnell choreographed and performied their duet, "Transcending Fluctuation," set to an original score by Peter Gonzales. These dancers like so many Cal Arts graduates moved with a fluidity and articulate grace that I have come to expect from that dance program. Their ability to move energy between them became the thematic center for the piece and was captivating to watch. Their sensitivity to each other in movement and energy made this piece a success for me. Shoji Yamasaki created his solo "Illumination" around the use of a standing lamp. You know the ones with the three bulbs that we all had (or have) in our dorm rooms or offices! He played with the directed light, manipulating it to shine around the entire performance space including the audience. The piece opened with his reading. . . and then eating a newspaper! It seems that the illumination was not just about light, but perhaps about information and knowledge as well. Thus in consuming the newspaper we was ingesting greater awareness. Perhaps enlightenment? I enjoyed how this piece was crafted around the lighting special, calling me back to time of pure experiment with the theatrical components of dance as well as the movement itself. Laura Laser choreographed the duet "The Battle" performing with Sacha Senisch. This piece based on a tribal figure and a birdlike character was particular evocative for me because just earlier that day I had gone for a walk and witnessed a red tailed hawk up close and personal. The dancers performed with strong line and powerful athleticism. The battle did not seem to be external, but rather an internal investigation of the bird spirit with each individual and our need to let it soar free. Cherise Richards palpably moved the audience with her stunning solo, "Will and Waves," which involved strong capoiera influences as well as surfing and water imagery. It was a personal journey of self reflection that was made extra special by the use of her own shadows on the white back drop (a coincidental boon that worked perfectly). The shadows reinforced the imagery of self discovery and reflection. Richards is a commanding and powerful performer who was able to use her strengths as a mover to tell a deeply sensitive story. "Interface" was a trio choreographed by Taryn Wayne. Performed by Laura Smyth, Sarah Bennett and Wayne herself. This performance took the show toward a more contemporary jazz feel, utilizing expressive gesture, powerful leaps, kicks and turns as the dancers wove in and out of the space in waves. The club-like dance feel of the accompaniment was a clear hit for the audience that couldn't help but groove a little in their seats. Stephanie Zatel performed "Fixed Movement," a spooky solo set to the live music composed and performed by Louis Lopez. Dancing on a small table, this piece made me a little nervous as she balanced right at the edge in an extended relevé. The nature of the piece was less clear for me, but Zatel's use of stillness set this piece apart and added to the unnerving nature of the piece. Only after she began using the small table as her own barricade of protection did I really start to match the spookiness of the music, movement and stark use of her emotional landscape. My piece (Megill & Company) performed "Pulled" next. In contrast to the other pieces, I see just how different my theatrical bias is for some current trends. This piece is sort of psycho-thriller set in dance. I created it to contrast all the humor and levity in the MeCo repertory, but out of context, it was eerie to see. Despite a little lighting malfunction, it went well. At least I think it did-- I was in it so of course I couldn't get the full effect. . .
Next, Ingrid Graham performed her solo "Artemis," leaving the audience in pure awe of her physique and technical background. There weren't bios in the program, but I can only imagine that before coming here from NY she received training in Horton and the Ailey style. She was a goddess on stage. Powerful. Regal. Impeccable. Jordan Saenz performed her solo "through the blood, bone and muscle" to another original music by Peter Gonzales. This piece stood out for its detailed musicality that perfectly reflected Gonzalez' electronic score. Saenz' movement is mesmerizing ebbing and flowing through her body that seemed at times to be made of rubber due to the way it arced and slinked its way through the space. Saenz is a highly articulate mover whose style blends both hip hop and contemporary modern into a very hip and very personal style that I can still recall in my memory (but could never hope to recreate on my own body because of its elusive nature). The show closed with another male female duet, "Visitor" co-choreographed and performed by Laura Ann Smyth and Mark Tomasic and set to a spooky remake of Britney Spears' Toxic by Yael Naim. Unlike the first duet, this duet was not a romantic escapade, but seemed more like a tortured memory of a couple faced with the demise of their relationship. The movement was loosely based in Jazz dance, however, kept a fresh and unique voice that is often unseen in current jazz dance choreography. The musicianship of both dancers was clear in their solo and unison movement and created a believable tension that ended with a thriller ending. As a whole, this event was what I want dance events in LA and Ventura to be. Unlike other festivals, I noticed a clear artistic and personal maturity in all of the performances in this show and from the audience as well. The relaxed environment made for an extremely friendly and supportive environment and the works themselves were very evocative for me as an artist and teacher. Special thanks to the owners and producers Karen Quick and Jennifer Vaughn who have started something very special with this project. I highly recommend you check out Live at LALA next time around!